New Brighton’s Marine Point development has won a Regeneration Award at a prestigious property event in Liverpool. Taking place on Thursday 15 October, the Your Move Property Awards celebrated Merseyside’s property market success, highlighting the region’s most successful residential and commercial projects. The regeneration of New Brighton has been a longstanding commitment for developer Promenade Estates. On the evening, Promenade was congratulated for creating a thriving leisure destination and placing the seaside town back to its former glory. The development, which began in 2011, has brought new restaurants, a hotel, a cinema, a casino and a supermarket, and provided more than 800 jobs to the area. It boasts the largest children’s indoor play frame in the country, Bubbles’ World of Play, and the updated Floral Pavilion is back to its position as a key player in the Merseyside’s theatre scene. The luxury apartment complex, The Prom @ New Brighton was completed in July this year and was the final piece of the jigsaw for Promenade Estates’ £60m regeneration project for the area. The 24 bespoke, purpose built apartments with views overlooking the Liverpool Bay have proved popular with buyers, with now only a final few available to purchase. The Prom @ New Brighton was runner up in the competitive Best Show Home category on the evening. Alongside Marine Point in the regeneration category, which was sponsored by MacBryde Homes, was Norris Green Village (NGV) by Regeneration Liverpool and Countryside; Joseph William Mews by Riverside Home Ownership and Old Widnes Town by Halton Housing Trust and Denovo Design. Due to the standard and quality of the shortlisted entries, the judges decided to award two regeneration awards to recognise both NGV and Promenade Estates’ Marine Point. The judges commented that the Marine Point development has ‘breathed life into a run down and barren landscape’ and has been so successful due to the ‘extensive commercial commitment’ from the developer. The resort is back in its place as a significant part of the Wirral tourism economy, which is valued at almost £328 million. Daniel Hynd, managing director at Promenade Estates says: “When Promenade started developing New Brighton, it was a project unlike anything that had ever been carried out in the Wirral before. We wanted to create a family destination, with a good mix of indoor and outdoor attractions to keep constant footfall all year round, and attract big-name restaurants to secure Marine Point as the place where people wanted to go. 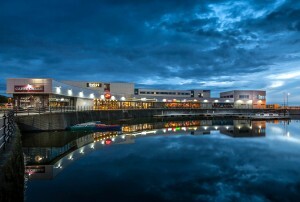 “Since Marine Point opened in 2011, it has become a thriving leisure space and completely transformed New Brighton to make it a leading destination in the Wirral. The completion of The Prom apartments earlier this year finalised our vision for the area, so we’re delighted the scheme has been recognised and won a Regeneration Award.